Experience research: Work with professors and graduate students on challenging hands-on research projects. Interested students should expect to dedicate at least 5 hours per week. Study abroad: The five-year EUROTECH program combines study abroad with an engineering internship at a German company in Europe. Students in this program receive a dual degree: both a Bachelor of Science degree (in Engineering) and a Bachelor of Arts degree (in German). Do it yourself: In the Senior Design Program, students gain hands-on experience working to solve real engineering problems for some of the most exciting companies in the U.S. and abroad. Graduate to great prospects: Mechanical engineering graduates earn a starting salary in the range of $50,000 to $70,000, with an average salary of $58,000 per year. Mechanical engineers employ their skills in mathematics and science to develop, design, and manufacture tools, engines, machines, and countless other mechanical devices that improve our standard of living. Mechanical engineering is one of the most diverse disciplines within the engineering profession. Mechanical engineers collaborate with doctors to design better medical equipment, research and build renewable energy technologies, and create robots that replicate human movement. 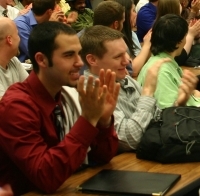 According to the U.S. Department of Labor, in 2004 mechanical engineers held a quarter of a million jobs in the U.S. From designing things we use daily, to leading innovation in such state-of-the-art technologies as nanotechnology, an emerging field in which engineers design and create functional systems at the molecular level, mechanical engineers help shape the future, as well as the quality of our everyday lives.